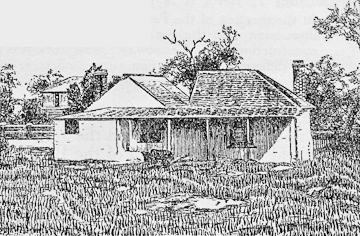 This sketch is from A Story of a Hundred Years: Western Australia 1829-1929 edited by Hal Colebatch. The Perth Gazette and Western Australian Journal of the 2 March 1833 noted "A mail is now open for England, via India, per Cygnet, at the General Post Office, Perth" and it is not known if this sketch is of that GPO or an earlier Post Office. General Post Office, Perth, W.A. 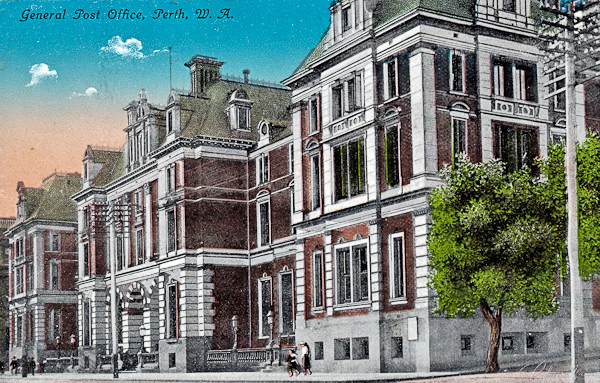 This is an early post card of the former Perth General Post Office, built before Federation. It was formally opened on 27 August 1890 by the Administrator of WA, Sir Malcolm Fraser before the process of moving the GPO to the new premises was completed. 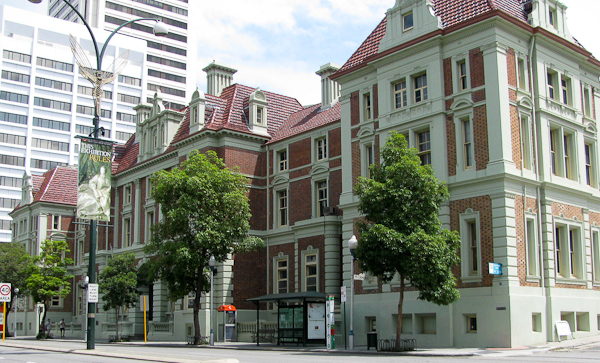 The building is located opposite the Stirling Gardens (then known as the Government Gardens) in St Georges Terrace. A similar picture of the former Perth GPO taken in 2012. After the new GPO opened in Forrest Place, this building housed the WA State Treasury. It is now almost derelict and the site is expected to be redeveloped as a hotel. 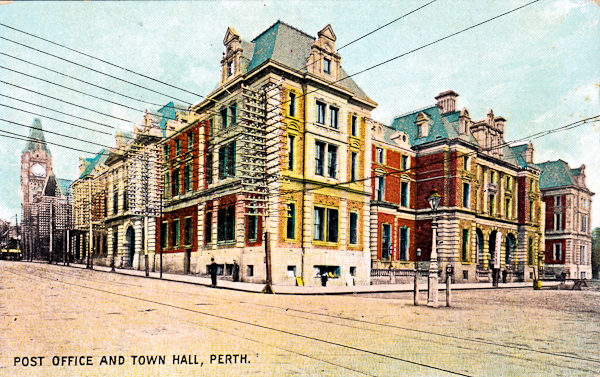 The clock tower on the left hand side is a part of the Perth Town Hall and most of this postcard is taken up with the Post Office. It seems that when the building was first opened it was often referred to as the Post Office. The sign above the main entry read "Post and Telegraphs". The south-east corner of the building is the zero point for calculating road distances from Perth. According to the information on the building this was adopted about two years after it had ceased to be Perth's GPO. 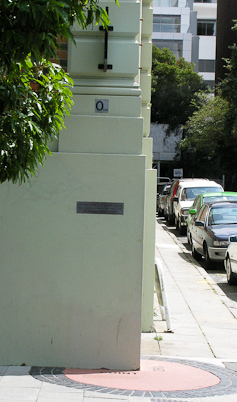 Australia changed from using miles to kilometres on road signs in 1974. Forrest Place P.O.and Commonwealth Bank on right. About 1940. A view of the Perth GPO built by the Commonwealth Government in Forrest Place. 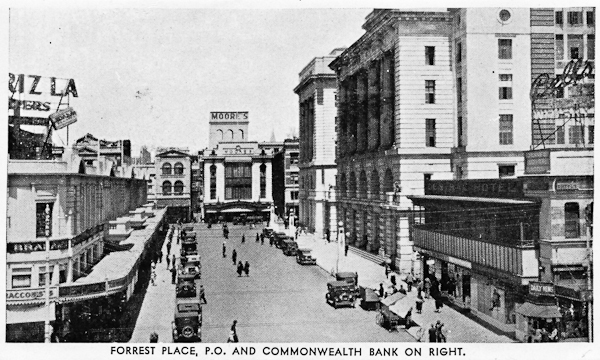 The GPO is the middle building on the right hand side of the street between the Commonwealth Bank building and the Central Hotel.